Warm the oil in a large saucepan over a medium heat. Add the onion, carrot, celery and thyme and saute for 5 minutes, stirring from time to time. Add the stock, tomatoes and borlotti beans. Season well and simmer for 10 minutes with the pan partially covered. Add the cabbage and simmer for a further 5 minutes. Taste and adjust seasoning. 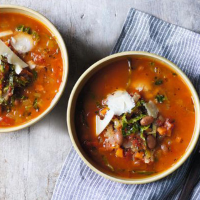 Use a vegetable peeler to shave the parmesan over the soup, and serve in warmed bowls.